Airlines Getting Desperate for Cash? Posted byEric Mesa	 5 Mar 2008 5 Mar 2008 3 Comments on Airlines Getting Desperate for Cash? Also, a plane ticket, which I, regrettably, did not photograph, had an advertisement for Papa Johns Pizza. Has it come to this? 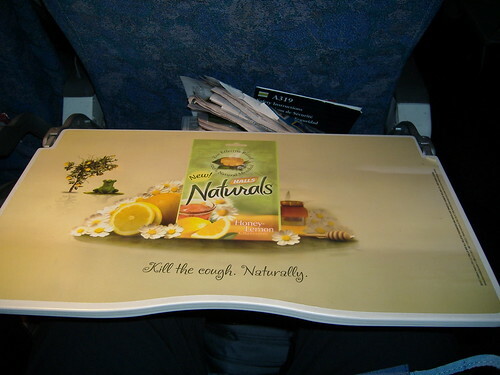 Are the airlines so desperate for cash that they have resorted to selling ad space on their tray tables and tickets. Flying used to be a refined affair that people got dressed up for. Now we have the same airlines that charged us so much money without giving us any food to eat, advertising on the tray tables. I think if they were clever they’d be advertising food since that’ll make you hungry and more likely to buy that crappy food they’re peddling now that you don’t even get a snack on most domestic flights. I’ve even heard that one airline is allowing food companies to offer product samples. Again, brilliant, if slightly disturbing. After all, you’re hungry and you can’t do anywhere. Why not try this free sample of product X.
I think our lives are become more and more bombarded by advertisements, both stealth and blatant. It’ll be interesting to see if this becomes and industry-wide standard. My comps’ names are scattered all over. I loved that Max’s computer in the movie Pi is named ‘Euclid’ and he talks about it almost like it’s a person. Since I used that name for my work box, I’ve wanted to keep using computer names from movies where they’re scary advanced to the point of almost being dangerous and also home made, but I haven’t found the list of that kind yet. Yeah, it makes for a fun naming scheme and allows for some creativity whenever a new computer is added to the network.